Have each student bring in a collection of 100 small items, such as paper clips, cotton balls, or pennies. Provide a poster board and let children create an artwork with the items. Break the class into 10 groups. Have each group make 10 paper chains. Come together and attach all chains to make a 100 paper chain. Have children spread out in the classroom or outside and lead them in ten sets of ten jumping jacks. Ask children for other ways the sets of jumping jacks can be divided for subsequent days. Then, do 100 jumping jacks using a different number pattern. Make sure children have enough rest between sets and access to water. Encourage children to only do the number of jumping jacks they feel most comfortable with. If desired, the sets of jumping jacks can be spread throughout the day so that everyone gets a chance to do 100 over a longer time period with many rests in between. 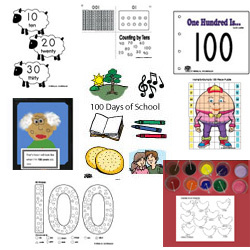 Break the class into groups and have them put together 100-piece puzzles. Provide 100 blocks, or paper cups, and let children create a structure. Have children spread out in the classroom for a dance break. Tell them they can dance in place using their best moves for 100 seconds. Then, play music for exactly 100 seconds (1 minute and 40 seconds). Use a stopwatch or second hand of the clock to keep time. Ask children if 100 seconds was longer or shorter than they thought it would be. What you do: Divide the class into teams and explain that each team will race to complete 10 sets of 10 exercises, with one team member completing each exercise for a total of 100 altogether. Present the exercises, and show children where each exercise station is set up. Once a team member completes an exercise, he/she must move to the next station and tag his/her team member to begin the next set. Parent volunteers can be asked to monitor each station. Possibilities for the ten exercises are 10 jumping jacks, jumping rope for 10 rotations, kicking a ball between ten traffic cones, touching toes ten times, bouncing a ball ten times, shooting ten baskets (a small trash receptacle can be used for the basket), balancing on one foot for ten seconds, completing ten sit-ups, and hopping on one foot ten times. Hi, ho, hi, ho, hi, ho. Here in the __________ grade. Bring our books and pencils, too. Make one hundred, oh so fine. Shout: 10, 20, 30, 40, 50, 60, 70, 80, 90, 100! Shout: 5, 10, 15, 20, 25, 30, 35, 40, 45, 50, 65, 70, 75, 80, 85, 90, 95, 100! Show children how to make the number 100 with one straight pretzel for the 1 and two small round crackers for the zeros.